Rare's Donkey Kong titles have recently been making their way onto the Wii U eShop in Europe — and hopefully will do so soon in North America — making it a good time to look back on the franchise. Whether that timing was part of its consideration or not, we do have Did You Know Gaming returning to the DK IP in its latest video. This video covers the Rare years, in particular, with some particularly interesting snippets on the later period for the company before it was acquired by Microsoft. 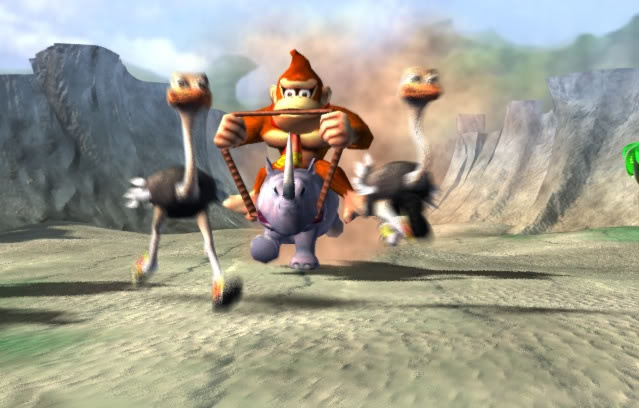 We're pretty sure that Nintendo Life is the source for the segment on Donkey Kong Racing, too, as our interview with former Rare man Lee Musgrave is directly quoted, as he told us more of the background to the ambitious title that never saw the light of day. Well theres some things i never knew but that racing game with all the different animals does look amazing in its own right. I was heartbroken about Donkey Kong racing never actualizing. I played so many hours of Diddy Kong Racing on my own and with friends, and I was so looking forward to it. Rare had so many games going at the time of the acquisition, and most of them got canceled or saw themselves release as a shadow of their original intent and potential. That Donkey Kong racing game looked pretty cool, and so did the one it turned into. They should really consider going back into it! @Agniza Please, STOP posting this. You've been reported and banned several times already and will continue to be. You are not fooling anybody with your scam. Please. Just stop bothering this community. I'm intrigued to know what Agniza was saying.. Sure it was just pointless trolling so thankfully he/she is banned now! Anyways, I love all the DK games I've played, Donkey Kong Country punished me back in the SNES days and I'm loving re living it on VC now, bought part 2 recently and will play it once I've finished the first, and will purchase part 3 next week..
@Inkling @Giygas_95 I understand your frustration, but addressing this "poster" directly is pretty much useless since nine out of ten times it's an automated spam bot. Just report it; that works most of the time, and has worked now as well, since the message has already been removed. Man, how I love this IP. My avatar should be a dead giveaway. My copies of Bayonetta and Fantasy Life won't arrive until later this week, so I spent this weekend replaying Tropical Freeze. Sidescrolling at its finest, and probably my game of the year so far (at least until Smash U hits). Hopefully, Nintendo of America will allow me to spend my holidays replaying the original SNES trilogy. Sometime, I'm gonna get around to getting the DKC trilogy on WUVC. @TheRealThanos Yeah, thanks. It's just that it won't go AWAY. My sentiments exactly. Love DKC- for me Tropical Freeze was a dream come true. I squeezed every iota of enjoyment I could out of that game. I even got into the time trial scene for a little while, managing 4th in the world on 6-K and 12th in the world for 6-1, with over a dozen runs that cracked the top hundred. That may not sound good to somebody who is better but for me, someone who never really did time trials in my life before, it was a proud achievement. I've since been knocked back to 13th for 6-K and 17th for 6-1. Still something to be proud of though I say. And I've been checking this website on a daily basis since the European announcement of the original trilogy. I think I've been pestering Nintendo for those games to come to virtual console on Club Nintendo surveys for well over a year now. I will be so happy when those games finally release in North America. @Pod True....though that said, Kameo still impressed me after all that time. Aaaaah, don't bring back those memories! Memories of Rare bought by Microsoft! AAAAAAAAAAA!!! @Deanster101 You mean to say that you didn't? Love the Donkey kong racing sketches and the Sabreman Stampede footage. Never saw those before.